I personally have experienced what a wonderful company and educator The Money Advantage is to me and my fellow REALTORS in the state of New York. I came across a podcast on the Internet where Rachel Marshall presented on Prosperity Economics, and her delivery was so clear and impressive that I had to call her to thank her for the education. The Money Advantage is unique in its teachings whereby education and knowledge are the primary goal. Rachel and her team are extremely professional and do and excellent job analyzing their clients’ needs and goals and strategizing how to best accomplish them. I highly recommend you listen to all the podcasts and hope you will conclude my recommendation was right on. I brought Rachel and The Money Advantage team in to speak to our YPN organization. There was such positive feedback, as they gave hope and solutions to many of the financial challenges we face directly as real estate professionals and business owners. Some of the key components covered were how to increase cash flow and confidence for the future in spite of our inconsistent income, and how to get on the path to real estate investing. When I sat down with them personally to discuss my own financial strategy, they helped me fully understand my financial picture, cash flow, and my options so I was empowered to make the best choices. The Money Advantage team are true Go-Givers, who really want to make a positive difference in the lives of everyone they serve. Since meeting them, I can't help but to urge everyone I encounter to have a conversation with Rachel and her team, and get started on their path to financial freedom. Rachel and The Money Advantage team are awesome. They take the time to understand their clients’ goals and then work with them to help achieve those goals. They do this by helping their clients maximize the cash flow in what they currently have as well as talk with them about investments to help them continue to cash flow. 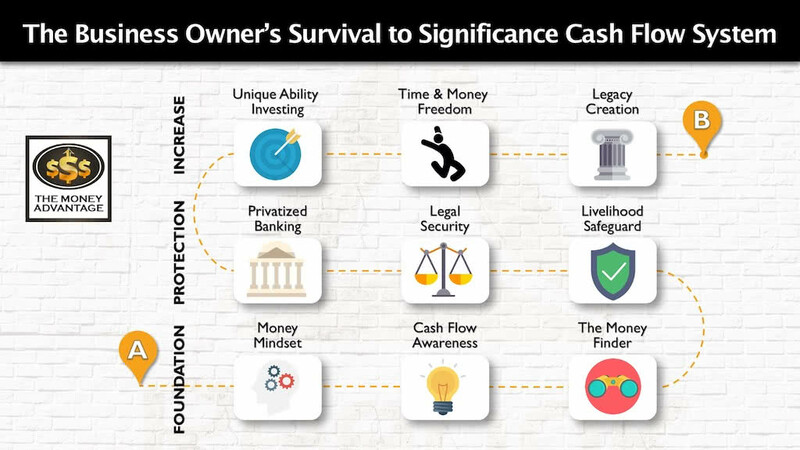 Rachel and The Money Advantage team have truly helped in my search for a better understanding of the Infinite Banking Concept as well as ways to improve and take control of cashflow; not only for my business/real estate but also my personal economy. They did a great job at aligning both; I truly appreciated their holistic and personalized approach to match my short- and long-term goals. I see the pride and passion they have with educating and building long lasting relationships with their clients. I cannot recommend them enough! As it’s been an enlightening journey for me. I also highly recommend listening to their podcast! Rachel and The Money Advantage team have a true passion for what they do. This was evident from the first time I met Rachel. They truly care about their clients and strive to make complex topics simple for a business owner. Their podcast helps to explain tax strategies, cash flow strategies, and other business advice in quick, easy to understand videos. I personally have participated in a three-part seminar at Old Dominion University with Rachel. The events were well organized, well attended and brought extremely valuable information to the audience. I would like to provide the highest recommendation for business owners to subscribe to their podcast and work with The Money Advantage team. See for yourself how they take complex, intimidating topics and turn them into easy, implementable strategies for business owners. Rachel and The Money Advantage team are very sincere people. They have a heart to give and a willingness to help others. They explained to my wife and I very clearly and effectively the different ways to manage our wealth. In a world full of uncertainty, The Money Advantage team are people you can trust. You will realize this from the first time you meet them. I would recommend them to anyone. They gave us a really good education. Their presentation on the options for holding our reserves was excellent. We found out a lot more about how it works and now I know exactly what I need to do to make it fit in our life. Rachel Marshall is an intelligent, perceptive and instinctively good podcaster and person. She is quick and decisive and is wise beyond her years. Every interaction with her is pleasant and she is a rising star in the financial world. She articulates the Prosperity Economics Movement in an unique manner. Her style is crisp and concise. I am proud to have her as a colleague and friend! Rachel Marshall and The Money Advantage team have provided small business and the community a unique process toward gaining and managing one's wealth. I highly recommend everyone to consider this unique and outside of the box concept of managing your finances. Rachel and The Money Advantage team communicate something that every business owner needs to understand: how to keep your capital, and seek financing. Knowledge that would put them in a more credit-worthy position to obtain the loans they need to operate and grow their business. Entrepreneurs and business owners are fantastic creators of wealth. The Money Advantage team does an amazing job of educating entrepreneurs on how to effectively store, protect, and utilize the wealth that entrepreneurs have worked so hard to create! I had the opportunity to work with Rachel Marshall and The Money Advantage team several years ago. Rachel helped me assess every area of my financial life from a new perspective. I began consistently working on my mindset, became aware of my cash flows, and covered every strategy to save and protect my money so I could be in financial control. The Money Advantage team truly cares about the financial success of everyone they work with, and has helped me leverage my money in ways I had not previously considered.